Brent & Shelley would love to hear from you and help you with your municipal, corporate or private event. We are not only good-will ambassadors for our wonderful community, we are also talented singers and musicians who have entertained across Ontario and the northern United States. 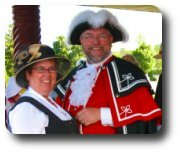 As Mr. & Mrs. Crier we have participated in parades, openings of businesses, fairs, special festivals and community events, read proclamations and greeted “M’ Lords and M’ Ladies” from all walks of life and in many languages. A guide to assist you in "What Should The Crier Say?" is available. © Copyright 2006 Brent McLaren. All Rights Reserved.